A Cortez couple battling Post Traumatic Stress Disorder is planning a therapeutic and educational tour of Western Colorado with their three donkeys. 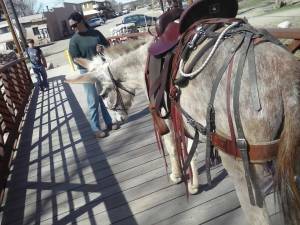 Rachel Karneffel hugs her donkey before taking off on walk around Cortez. Wolf and Rachel Karneffel will soon embark on “Donkey Trek 2015 — Trekking for Troops,” a combined mission advocating for working donkeys and support for war veterans. Their educational and fundraising journey will take them from Cortez to Colorado Springs and then Grand Junction. Wolf, 30, suffers from PTSD after serving three combat tours in the Army during the Iraq War from 2004 to 2011. Working with donkeys has become his salvation. Wolf was a combat engineer in the Iraq War, one of the most dangerous positions in a firefight. “As a gunner we cleared the route, looked for bombs, and in the process got shot at and blown up a lot,” he said. Donkeys are often forgotten or discarded, Wolf said, a parallel he sees with some veterans who come home from war. Equine facilitated therapies are gaining in popularity, explained Rachel, who works at the Medicine Horse in Mancos. Like all animals, donkeys act congruently, meaning their inner feelings and desires line up with how they act in that moment, a useful trait for therapy. Wolf, who is Lakota and Mayan, said the trip is giving him renewed purpose, and he is eager to share his experience. “I’ve tried all the therapies. Until I discovered a bond with these animals, nothing could ease the trauma I keep re-living everyday. I’m looking forward to a life affirming experience, creating new memories with my wife, leading our donkeys across the state and promoting our cause,” he said. The couple will lead three adopted donkeys — Charlie, Pippa, and Raymond — and camp along the way. The friendly, sturdy animals, dubbed “the original ATV,” will carry all the provisions. They’re saddled trained and can be ridden from time to time as well, Rachel said. The entourage plans to depart weather permitting, probably in May. “Watch for us in Cortez as we get them acclimated to roads and traffic, and being swamped by people,” Rachel said. Fundraising will go towards starting a veterans program at Medicine Horse to help those suffering from the physical and mental wounds of war.